Time.com predicted on November 7, 2016 that Hillary Clinton would win the presidency by an electoral vote count of 323-215. Trump won, 304-227 (with 7 faithless electors). 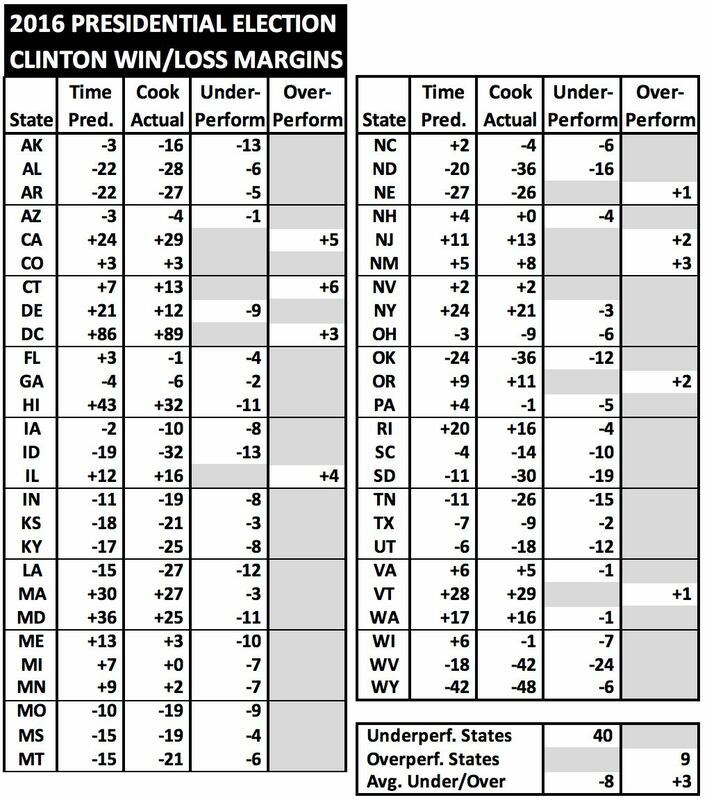 Clinton underperformed pollster expectations in 40 states, and overperformed in only eight states and DC. The underperformances averaged 8 points, while the overperformances averaged only 3 points. Further, 7 out of the 9 Clinton overperformances were in states (and DC) the Trump campaign ignored as lost causes (CA, CT, DC, IL, NJ, OR, VT). The only exceptions were NM, where Team Trump thought they might have a chance (and were wrong), and the trivial difference seen in NE. As to battlegrounds, Clinton only held on in relatively small CO, NH, and NV. She lost five others collectively large states (FL, IA, NC, OH, and PA), plus two other states with expected Clinton victory margins of 6 points or more which weren’t thought to be serious battlegrounds (WI, MI). I maintain that what happened in 2016 was far more a rejection of Hillary Clinton than an embrace of Donald Trump. That said, that dynamic now appears to be on the cusp of changing (or may have already changed). Whether it continues in Trump’s direction between now and the November 2018 midterms remains to be seen.